When should you use RG11 cable? RG11 cable has a sort of mystique about it. Talk to satellite TV junkies long enough and sooner or later someone will bring it up. Some people think it’s the magic potion that lets you extend your signal indefinitely, others think it’s an overpriced “crock. Some say it’s for outdoors only, and others swear by it for every cable. What’s the truth? RG11 cable isn’t terribly different from garden-variety RG6 cable, actually. It’s just sort of the Incredible Hulk to RG6’s Bruce Banner, if you get that reference. If you don’t, RG11 cable is thicker and stronger in just about every way. 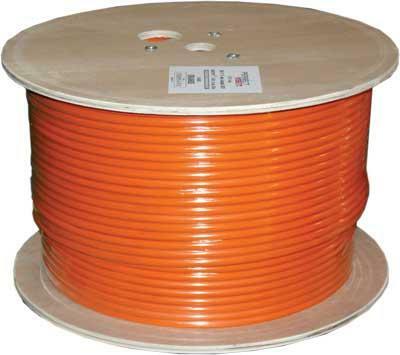 In order to be classified RG11, the center conductor uses a 1.2mm center conductor (RG6’s is about .73mm) and the cable as a whole is larger in outer diameter owing to thicker parts all around. Thicker wiring and a thicker foam dielectric (the white part in the middle) mean RG11 cable has less loss over distance, and that’s the whole point. In general, RG11 cable gives you 50-75 feet more run before a signal gets too weak to use. That can really make the difference, especially in cases where you can’t use an amplifier. When you attach a connector to a cable, there’s always “return loss.” Return loss is something like the spillage you get when you pour water into a glass and you don’t pay attention. When signal hits that connector, there’s always a small amount that bounces back, called a reflection. Supposedly if you’re using RG11 cables shorter than 100 feet, reflection can be a real problem and can actually hurt the signal. My gut tells me 100 feet is a bit much for that sort of thing but better safe than sorry. Whether you can or can’t, you really don’t want to use RG11 for short cables. It really is extremely hard to work with. It’s also a lot more expensive, not just because of the higher cost of materials but because it’s also not in demand as much as RG6 cables. So whenever you can, you should use RG6. People ask whether all RG11 should be burial rated or solid copper center conductor. Obviously, you only need a burial rated cable if you’re burying it. As for solid copper, only cables that carry current need to be solid copper center conductor. If you’re extending a cable run from a multiswitch to a receiver or from a cell booster to an antenna, you don’t need solid copper unless you’re actually connecting the power supply to it. In the case of an antenna preamp, you would need solid copper there. Solid copper does make cables a lot more expensive, but it is required for all DIRECTV and DISH approved installations even where it’s not strictly needed. Choosing the right cable can be tough and if you’re looking for a good course on how to pick the right one, check out our Cables 101 series. If you’re looking for RG11 cable, shop now at Solid Signal!